US Agencies Lead with 101 Shortlisted Entries Followed by South Africa with 40 and the United Kingdom with 24. The Midas Awards® for the World’s Best Financial Advertising℠ announced the shortlist for the 2017 competition. Worldwide since 2001, the Midas Awards is the only awards show to recognize excellence in financial advertising and marketing on a global scale. The spotlight was on global agencies competing for the number one spot on the Midas Report. The following agencies are top forerunners for the 2017 annual ranking: McCann New York with 31 entries achieving shortlist status; Cullinan, South Africa with 23 entries shortlisted; OneTeam with 19, McCann London with 12 entries moving on the medal round; and R/GA Sao Paulo and MRM // McCann New York each with 10 entries; Havas Düsseldorf and Saatchi & Saatchi Sydney each advanced with 8; and MullenLowe Boston, Fp7/MENA, and McCann Canada moved ahead with 7 entries shortlisted. Strategic sponsorships provided opportunities for brands to target specific demographics while increasing awareness and consumer engagement. Entries shortlisted from the Sponsorship category include: Playmaker South Africa with “The ReadytoWork Absa Premiership campaign” for Absa; Quicken Loans Detroit moved forward with “Rickie Fowler campaign” for Quicken Loans; MRM // McCann New York advanced with “A Focus on Optimism - Forbes Women’s Summit” for OppenheimerFunds; and OneTeam moved to the trophy round with “Citi | Proud Global Partner of the Presidents Cup, Proud Sponsor of Progress” for Citi. In addition, FCB Africa (Pty) Ltd South Africa advanced with“Absa Premiership Rivalry” for Absa; Cullinan South Africa moved to the trophy round with “Conquer as One” Absa and “Give Art Life” for Absa/Barclays; McCann Worldgroup London “BRIT Awards 2017” and “UEFA Champion's League Women's Final” were shortlisted for client Mastercard; McCann New York advanced with “#ArnieWould” and “Sound of Priceless” for Mastercard; and McCann Worldgroup EMEA London moved ahead with “Buffon Priceless Surprise” Mastercard. International agencies from around the world utilized high-profile event marketing to gain market share on behalf of prominent brands. Entries advancing submitted into the Events category include: Zulu Alpha Kilo Canada’s “Flash Box” for client Interac Association; Havas Düsseldorf “Evil Zero” for DWS Investments; Etiket South Africa “Harmonograph” for FNB - First National Bank; McCann New York for “Fearless Girl” “Eclipse 2017: Through the Eyes of a Child” and “My First Purchase Exhibit” all for MasterCard; McCann Canada “Priceless Tables” for MasterCard; and “Factory Detroit, Inc.” “Pop Up Dinner” for Invite” for First Citizens Bank. McCann New York moved forward with 9 shortlisted entries for “Fearless Girl” for their campaign designed to promote State Street Global Advisors’ SHE fund: an investment fund for companies with more women in leadership. The statue of a young girl standing up to Wall Street’s iconic Charging Bull became a powerful piece of city art and a social media phenomenon. In just 12 weeks the campaign achieved 4.6 billion Twitter impressions in 12 weeks, 745 billion Instagram impressions, a 379% increase in State Street share of voice, and a 384% increase in SHE funds traded daily. Cullinan South Africa’s “Give Art Life” had 22 entries advance for client Absa/Barclays. The campaign was launched to inspire young artists in Africa and to create awareness for the Annual L’Atelier Art Competition. Cullinan created art pieces employed art and human canvasses to give art life. The results—awareness of the L’Atelier was raised substantially with an earned media valued at R13.5 million and young artists were given the power to change the world. “Conquer as One” for Absa also moved forward. OneTeam had an impressive 19 entries shortlisted for campaigns created for client Citi including: 2 entries for “The Citi Double Cash Card: Holiday Cards That "Say What They Mean,” 2 for” The Citi Double Cash Card: Means What It Says,” and “The Citi Double Cash Card: "Means What It Says" Campaign - Neighborhood :30,” “The Citi Double Cash Card: "Means What It Says" Mets Campaign,” “The Citi Double Cash Card: "Means What It Says" Snapchat Campaign,” and “The Citi Double Cash Card: Holiday Cards That” each advanced. Additional entries shortlisted: 2 for “Citi Emotion Campaign - Integrated Campaign,” 2 for “Citi Emotion Campaign - TV Campaign” and 1 for “Emotion Campaign - Progressive Blue Wave.” In addition, “ThankYou® Rewards Points-illism” saw 2 entries advance and “Citi | Proud Global Partner of the Presidents Cup, Proud Sponsor of Progress,” “Citi® / AAdvantage® 30 Years Of Wow,” “Dine & Do Good,” and “Taste of The Nation” were each shortlisted. Global agencies employed a variety of strategic initiatives to engage consumers on behalf of the brand. R/GA Sao Paulo saw 10 entries shortlisted for “Next Bank,” their campaign for client Bradesco Bank. The campaign promoted the brand’s entirely new mobile-only bank that empowers digital-savvy millennials while seamlessly integrating into their lifestyle. Fp7/MENA’s saw 7 entries advance for their emotional campaign for Byblos Bank, “There’s No Home Like Home.” The campaign tackled the decline in home loans in Lebanon by targeting Lebanese ex-pats abroad to introduce The Expat Housing Loans. Havas Düsseldorf’s saw 8 entries shortlisted for “Evil Zero” for DWS Investments, the campaign utilized, TV and print, online, promotions, an augmented reality app, giveaways, interactive installations, and guerrilla marketing to attract the attention of potential investors. In this year’s Midas Awards competition, the United States took the lead with 103 entries shortlisted. South Africa saw 40 entries shortlisted, the United Kingdom advanced with 24, followed by Australia with 14, Brazil with 13, Canada with 12, Germany with 10, and Lebanon with 7. Agencies from Singapore and Turkey each saw 5 entries shortlisted, Myanmar and the Netherlands advanced with 3, and India and Japan each had 1 entry shortlisted. Prominent international brands in position to be included in the Midas Brand Report, an annual ranking report based on points earned within the Midas Awards competition and celebrates advertiser’s performance in elevating the financial advertising industry include: Mastercard, Citi, Absa / Barclays, Bradesco Bank, DWS Investments, Byblos Bank, OppenheimerFunds, E*Trade, and State Street Global Advisors. 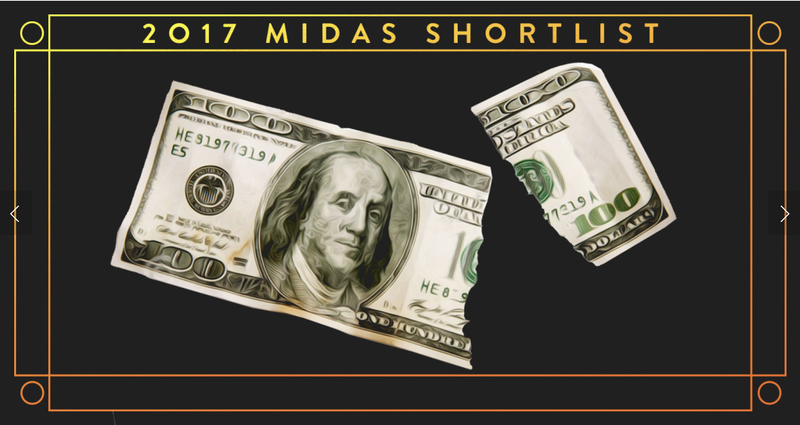 To view the 2017 Midas Awards Shortlist please visit: https://www.midasawards.com/2017-short-list/.